I had a chance to try out this clear skin kit by The Compound Factor. The packages comes with a cleanser, toner, corrector (for oily skin), spot solution (acne treatment), and a bottle of probiotic dietary supplements, which apparently help clear your skin as well. By using all of these products in order once a day, you should see clearer skin in no time. 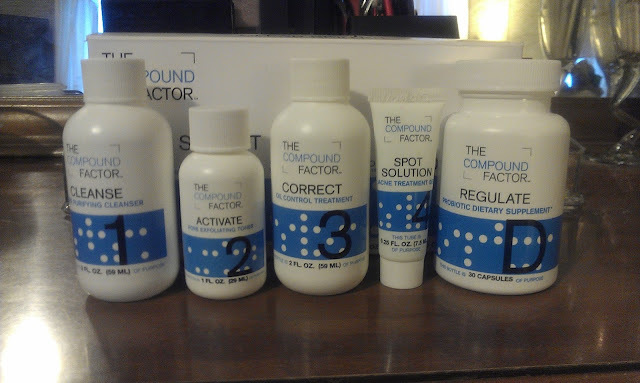 I decided to use these products twice a day (except the supplement, which was only taken once a day) for two weeks. I will say that I loved all of these products and need to point out that the oily skin corrector states to apply a thin amount up to three times a day (same with the acne treatment), however it's a thicker cream and was a little tough to get out of the bottle in a small amount. You may be better off transferring this to a bottle with a pump dispenser on it. 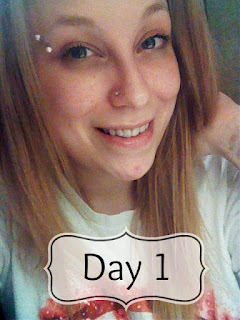 That being said, here's my comparison between day one and day 14. 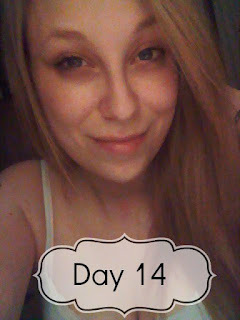 As you an see, it started to clear up my skin a little bit in the two weeks I've been using this kit. I used only this kit for the two weeks and no other creams or serums, with the exception of my under eye cream since that would have had no effect on the results because none of the products in the kit were applied anywhere near my eyes (Just cheeks, chin, and forehead). Overall, I like the results, but I'm interested to see the difference once I'm through all the bottles. There are 30 supplements in the bottle so there should be enough in all of these bottles for for 30 days.